Gunadhar Sahis hails from a family of Natua dancers who have been practising this art for more than six generations. Having lost his mother when he was a month old, Gunadhar grew up on an extreme diet of this exceedingly physically demanding dance. Accompanying his father for his performances, he was often seated on stage, observing and absorbing avidly. He was all of seven when he started training under his father and guru, Babulal Sahis. When he was about 15 years old, he started learning the Chho dance as well - the first in his family to master this form - though he continued to perform and receive guidance from his father in the family tradition - Natua. Excelling at his art, he was appointed as a teacher in the government sponsored Gurukul, teaching both Natua and even the male-dominated Chho to women. He also teaches other traditional folk forms like Jhumur, Tusu and Karam dance at various schools. At the gurukul, he has about fifty students, ten of whom have been sponsored by the government. Gunadhar is also often invited to Madhyamgram near Kolkata, to hold classes by a local NGO, who encourage Natua training as a fitness and self defence regime. 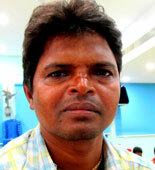 Apart from his teaching and performing assignments, Gunadhar works on the field and is also a manual labourer. Recipient of the Sudhi Pradhan Puraskar (Award) from the Folk and Tribal Centre in 2000, Gunadhar has been invited to perform in various cities in government sponsored programmes. He usually presents both Natua and Chho. Though he performs and teaches the form, both to his sons and other students, there is grave doubt about the future of Natua - the chief reason being the extent of physicality and hard work it demands. Performers ideally have to be fit and not lack in nutrition. This unfortunately is not the case - with poverty inherent among the traditional Natua communities. Thus, there are very few takers for the form. Gunadhar, however is a survivor. Having "diversified" to other forms and having earned some recognition, he is reasonably happy with his lot. Moreover, with traditional forms now being performed the year round at sponsored fairs and festivals, there are far greater opportunities to earn. The Natua, for instance, was traditionally performed only during the Shib Gajon festival, celebrating the marriage of Shiva to Parbati (Durga).